to cause your intended to give chase! for good luck in gambling and romance. Well, it looks like our hot, dry Summer may be coming to a precipitous and early close, as the temperature is dropping, grey clouds are moving in, and the first few rain sprinkles have hit the roof and the thirsty lawn and flower beds. I'm sure we'll have a few more sunny weeks before the real rainy season sets in, but right now i feel like curling up with a cup of hot tea! Brrrr. The Lucky Mojo Hoodoo Rootwork Hour is the longest-running and most popular show of its kind. On air and on the internet since 2004, The Lucky Mojo Hoodoo Rootwork Hour has brought you a wealth of information about conjure history and contemporary spiritual rootwork practices, featuring your host catherine yronwode of luckymojo.com and her co-hosts, plus top-notch panelists and special guests from the conjure community who provide our call-in clients and the listening public with authentic divinations and traditional rootwork spells, tricks, and remediations. New Co-Host: This October we bid farewell to our long-time co-host and board operator Dr. Kioni (be sure to catch him on his own radio shows online!) and welcome our new co-host ConjureMan Ali of theconjureman.com. ConjureMan Ali is one of the most popular and well-respected contributors to the Lucky Mojo Forum, where he answers hundreds of questions per month from people who want to know how they can use hoodoo in their own lives. He is also a respected member of the Association of Independent Readers and Rootworkers (AIRR), whose services are sought for readings and rootwork by clients from all around the world. New Board-Op: Our new full-time board engineer is a name familiar to many of you because he has run the board and the radio chat room for years when his services were necessary -- it's nagasiva yronwode, of course! Special Guests: Starting on October 9, 2011, cat and Ali will be hosting a series of special guest appearances by the members of AIRR, the Association of Independent Readers and Rootworkers. Each week a different AIRR member will be introduced and say a few words about him or herself, and will then participate in providing readings and rootwork advice to our callers. If every member of AIRR takes a shot at a guest appearance, we expect that this new feature of the show will continue for about half a year! Our Announcer: Miss Tammie Lee of triplecrownconjure.com is our regular announcer and chat-room co-ordinator, and she will continue to do what she does best -- bringing in our guest callers, reading their stories, and setting up our readings and rootwork consultations. Get Free Readings and Rootwork Advice: To be selected as a caller to the Lucky Mojo Hoodoo Rootwork Hour you will need to pre-register at the Lucky Mojo Forum Radio Show Board. It's simple -- just follow the link, then click on the thread dated for NEXT WEEK'S SHOW. Read and copy the first post, which contains the questions we need answered, then follow the directions and be in the queue on the date you have specified. If your telephone area code is called, say hello -- and you are ON THE AIR. Same Time, Same Station: The Lucky Mojo Hoodoo Rootwork Hour (which, by the way, is 90 minutes long!) is brought to you every Sunday at 3:00 PM Pacific / 6:00 PM Eastern time via the Lucky Mojo Blogtalk Radio Station. Details, as always, are below in this newsletter. Be sure to tune in every week, as the familiar strains of "The Jug Band Waltz" signal the opening of another episode of the world best-loved traditional conjure show -- The Lucky Mojo Hoodoo Rootwork Hour! � The Shop Painting Team is just about done with the main display room and will be moving into the back office and shipping department for the next couple of weeks. Installation of the beautiful gilded Victorian casing moulding on the shop display room beams continues, with a new and improved track lighting system to follow. Our thanks, as always, to Chris K., to Chris M., to Roger, to our patient Shop Manager Robin Petersen for not blowing her top, and to all of our faithful walk-in customers who keep coming back despite the overarching chaos, and who lift our spirits with cheerful comments on our progress. 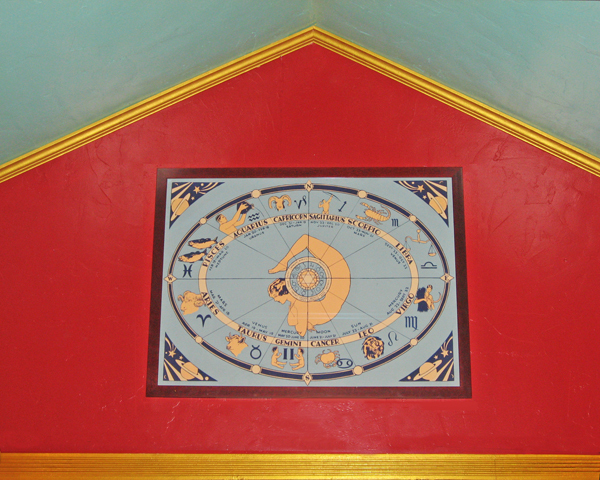 � This month's photos: Up top you can see the newly painted South gable of the shop, bedecked with a spectacular Robert Nelson Zodiac Poster, a gift from Ron Shank, my dear mentor and elder in the arts of palmistry and tarot and my dear student (HA!) in the arts of Southern hoodoo and rootwork. 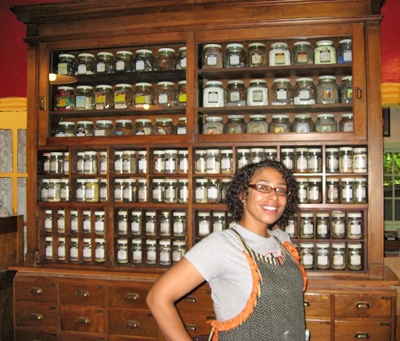 Directly below is our trusty Lab Team member Alicia standing in front of the 12-foot tall antique apothecary cupboard. Removing the herb jars and taking this monster down to paint the wall behind it was a huge task, and Alicia looks proud and happy to see everything back in place again! 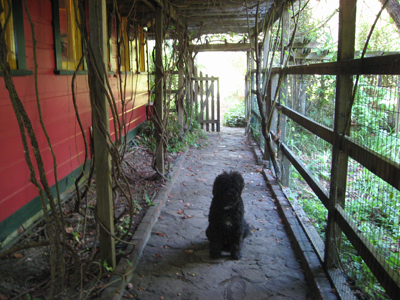 And farther down the page, that's Sophie the Portuguese Water Dog sitting in her dog run, watching the lady with the camera and holding a very good "sit-stay." � This month's fantastic new items in the shop, according to Robin Petersen, include statuary and altar pieces for Santa Muerte, Saint Martha Dominadora, Goddess Kali, Saint Cyprian, and Lord Ganesh. These are special, lovely, AFFORDABLE hand-painted resin statues, ranging from 8 to 12 inches in height. We did not have time this month to include images of them on the Lucky Mojo Statuary page in our online catalogue -- but you can find them by name if you go to our Complete Inventory page and scroll down to the Statuary section. � Also new in the shop this month are more wonderful glass Crystal Balls in fabulous new transparent colours, including cobalt Blue, whisper Pink and luscious Lavender! These come in the convenient and inexpensive 2", 2 1/2" and 3" sizes and they are a new addition to our popular selection of glass crystal balls in Clear, Black, Red, Green, Honey-Amber, and Aqua. The 2" balls, at $11.00 each plus shipping, are quite a bargain, especially when you remember that ever since May of this year, with every crystal ball you order, you get a free book on Silent Influence With the Crystal, plus a one-year membership in the Crystal Silence League! � The Association of Readers and Rootworkers, a committee of Missionary Independent Spiritual Church, is proud to announce two new AIRR members: Brother Jeffrey Vanderson of Birmingham, Alabama, already known to many as the editor of the Crystal Silence League Newsletter, and Marin Graves, proprietor of The Parlour, an old-fashioned psychic tarot reading room in historic Grass Valley, California. Welcome to AIRR, Marin and Brother Jeffrey! � The Lucky Mojo Hoodoo Rootwork Hour, brought to you every week by catherine yronwode of luckymojo.com and ConjureMan Ali of theconjureman.com, is a live call-in show, where we will read your fortune and prescribe down-home, old-school conjure and rootwork remedies! Special Guests from AIRR, the Association of Independent Readers and Rootworkers, will be featured on October 16, 23, and 30, 2011. Tune in and see who's up! Deacon Millett, Dr. E., Marin Graves, Momma Starr, Miss Michaele, and the rest of our wonderful colleagues at AIRR, the Association of Independent Readers and Rootworkers, are cooking up something very special and have asked Lucky Mojo to invite all of you "early-bird" fans and friends to watch it grow. The new project is called Hoodoo Psychics -- and it is the only Live Psychic Reading Line under the direction of a group of traditional conjure doctors and spiritual hoodoo workers. If you like AIRR, you will LOVE Hoodoo Psychics! For updates and more information, please go to the Hoodoo Psychics Facebook Page, then "like" the page and say hello, so that Hoodoo Psychics updates will appear in your Facebook newsfeed. This month's Discount Coupon will save you a bunch of money at the Lucky Mojo Curio Company, so go ahead and use it -- you know you want to!